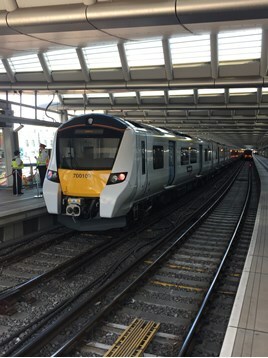 Manufacturer Siemens and operator Govia Thameslink Railway told RAIL on May 24 that discussions are ongoing regarding fitting plug sockets, Standard Class tables and WiFi retrospectively to the Class 700 fleet. GTR said that the design was essential to meet huge passenger growth, which has soared by 40% in the past decade. The trains feature wider doors and aisles, to make getting on and off easier, as well as spacious walkways between carriages made possible by the removal of vestibules. Passenger feedback was sought, and this has resulted in the fitting of 2+2 seating instead of standard 3+2 seating, although this has resulted in fewer seats in the trains. The reduction in seating is offset by an increase in space. The ‘700s’ are fitted with adaptive climate-controlled air-conditioning that adjusts to the number of passengers. Electronic signs are also fitted to show passengers where seats are available, or where there is more space to stand. Similar screens are also being fitted at stations across the Thameslink network. Screens will also carry real-time service information both for the GTR and Transport for London networks. “Not only will many of these trains be longer and more spacious, they will be cutting edge with real-time information from around the network and the Tube,” said GTR Chief Executive Officer Charles Horton. They better put at least tables. Plug sockets should of been in the original design specification and Wi-Fi as they claim the new trains to be hi tec and 'the future'. By the seems of it, it's the Past! WiFi on the Class 700's ideal because at least the passengers would know if there are delays on their commute to work & back home. What bright spark forgot to design a plug in 'free wifi' + space for coffee and at the very least a mini iPad? It seems the trains have not been designed with the commuter in mind (have you not noticed, we are all busy working on these long and slow commutes to London every day!) Do we really need first class carriages? A bit out of fashion and highly ineffective. Perhaps they could be utilised for standing only carriages for the peasants? Apart from that, they look very nice, however, probably not tested on humans. Do the stakeholders catch these trains? 'The trains are designed by Siemens to meet a specification developed by the Department for Transport in consultation with train operators and other stakeholders. Wi-Fi was not included in the original specification laid out in 2008. However, the trains have been designed to make it as easy as possible for Wi-Fi (or an alternative next generation technology) to be fitted'. Thameslink Rolling Stock Qualitative Research Research Report Prepared for: Passenger Focus, in a joint project with the Department for Transport and London TravelWatch Date: April 2008 At Seat Facilities: Passenger views regarding tables and catering are determined primarily by the length and nature of the journeys most frequently made. Tables are not widely regarded as a key priority among most user groups. However, if being considered as part of the train design, being able to accommodate a laptop should be regarded as a fundamental design principle. Having four seats around a table is considered a luxury by most, especially on relatively short journeys that are typical on FCC routes. Furthermore, this was felt to be at odds with the overall objective of maximising space available. “We don’t have those big tables on trains at the moment and I wouldn’t want them.” [Camden, Commuter] “Having airline style seats would solve the problem of whether to have tables or not because everyone has one in the back of the seat in front.” [Camden, Commuter] “I can’t really see the benefit of having tables on these trains.” [Wimbledon Loop] The small side tables that feature in some current FCC trains were often criticised for not fulfilling any useful purpose, and cup holders were requested on the basis of enhanced functionality and potential space saving. “Those mini tables are pointless, I don’t know what they’re meant for.” [Camden, Commuter] “You’d be better off with cup holders than those stupid little things they have now.” [Camden, Commuter] A buffet car is felt to be completely inappropriate on trains serving Thameslink routes. A refreshment trolley would be impractical for commuter services but may be welcomed by off-peak users. Respondents suggested that their needs may be better met by outlets/vending machines at stations, although this was balanced by concerns about vandalism. “You don’t need it on such a short journey. You can get something at the station or when you get to work.” [Camden, Commuter] “It’s nice to be able to get a cup of coffee but not essential for a journey of that length.” [Brighton, Commuter] WiFi and Power Sockets: Both are seen as non-essential for the new Thameslink trains given their relatively short journeys, but if provided are likely to make a positive contribution to the overall journey experience. There is a high awareness of the increasing availability of WiFi across the transport network and train operators already providing it are seen as innovative. Thus, there is potential to add value to the service provision if the trains are WiFi enabled, especially if available free of charge. Most however accept that WiFi would be hard to justify due to the length of journeys undertaken. “You only need it on long journeys because there’s no room to work when you’re commuting.” [Croydon, Commuter] “It’s not essential but if it was available then your estimation of the train company would go up a bit.” [Camden, Commuter] Power sockets are not expected to be provided on FCC trains, and are seen as more of a necessity for train operators with longer routes. However, they would be welcomed as an additional facility, being useful to charge a phone / laptop even if not using them on the journey. Overall, their provision would be likely to be seen as a passenger benefit. “They have them on Virgin but it’s not necessary for a short commuting journey.” [Camden, Commuter] “It would be brilliant to be able to charge your mobile phone if you needed to.” [Camden, Commuter] Very little in terms of minimum expectations to fulfil. Some table provision is hoped for. Some catering provision during off-peak times would meet expectations, if feasible. Providing free WiFi and power sockets would exceed expectations.